I forgot to list cheese under things I am grateful for...I truly do love cheese, and I have said many times that I could be a vegetarian if pressed--but the person who tries to keep me from cheese will have his head taken off! Also, snowstorms. We are in the middle of one right now, and there is just nothing nicer than being inside the warm house, everybody together, watching the snow fall! Having the kids in and out playing and coming in and dripping water all over the floor and having wet boots, scarves, gloves, hats, snow pants and coats drying around every free surface is a drag, but it still doesn't obliterate the excitement of snow. I'm sure I could come up with more for my list, but it's New Year's Eve and Matt is making bread, so I think I'll go talk to him while I enjoy my delicious Starbuck's coffee--which by the way, falls under the coffee heading. Except more so. Many of my friends talked about gratitude on their blogs or on their Facebook pages for Thanksgiving. Well, as usual, I procrastinated on this subject! The reason was not because I have nothing to be grateful for, certainly, but rather because I was very busy getting ready for the holiday and our trip to Boston. 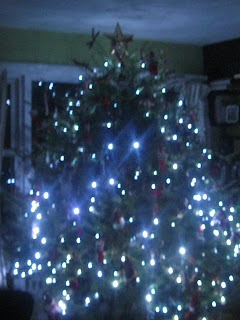 And then when we got home I had to rev into Christmas mode (also because I procrastinated...I am sensing a New Year's resolution coming on here!) and do all the decorating and shopping and baking and mailing. However, now is also an appropriate time for gratitude, since the year is drawing to a close. Time to take stock and realize how good life is and all that....so I am going to make a VERY long list of all the things I am grateful for, and I warn you they will range from the obvious to the minute details, so you may want to bring a pillow in case you fall asleep! * The first one is, obviously, Matt. He is my best friend and my husband, and without him life would be dull and dreary. He makes me laugh, he makes me think, and he makes me mad! Which really are three of the most important things in life, I think. * Naturally my children rank a very close second. How could I be the person I am without them? Each one is unique, even though they have similar personalities and habits. Each one is a precious person--even when they make me want to scream. Because that is, after all, their reason for being--to make their parents unable to decide whether they should smother them with kisses or just smother them! * The third would be my extended family. My parents, who are wonderful, supportive and really just the best parents I could ever imagine. My sisters, brothers, their spouses and all my nieces and nephews (plus my 2 nephews-in-law and my darling grand-niece-and nephew!) are just each and every one a joy to know. I am unbelievably lucky to love every member of my family and to enjoy spending time with them--it sounds very corny, but I know so many people who truly don't enjoy spending time with their extended families, who fight all the time with them and have these feuds and bicker and complain about them. I can honestly say that my family gets along (and we disagree strenously on many issues such as religion and politics--we still treat each other civilly and respect each others' beliefs) and really likes to spend time together, and I treasure that. * Coffee. Do I really have to expound on that? * Homeschooling. Yes, I have many days where I wonder what on earth I was thinking when I agreed to keep my children with me pretty much 24/7 till the age of eighteen! There are days when I feel burned out and overburdened and just want time to myself and look at the school bus with longing. But at the end of the day, I know that what we are doing for our kids is the best for them, that they are enjoying life so much more than they would stuck in a classroom all day, and that they are learning so much more too. 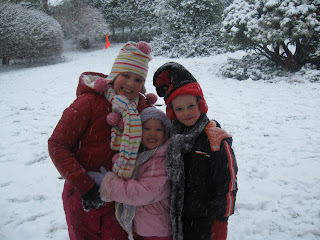 And I also realize how quickly they will be grown and on their own, and it makes me want to treasure the time with them. Even when I feel like the biggest harpy on the planet! * Facebook. I have taken SO much ribbing from Matt and certain brothers-in-law I know, and yet, joining Facebook this fall has really brought me joy. I have come back into contact with many old friends from grammar school, high school and college, and forgotten how much I loved them. Keeping in contact is difficult--visiting is hard because of distance and vacation time is limited. Phones are wonderful, but you have to find time where both parties are home and can chat (in peace!!!) Letters are nice, but who has the time? Email is great too--but it's hard to remember to keep in touch if the other person is not a great correspondent. Facebook, on the other hand---fantastic! I write emails, IM with friends, we send each other silly gifts, drinks, hugs and smiles, play games together and reconnect. We even plan reunions. These are people I have always kept in my mind, but never pursued, and I am overjoyed to see that they are all the same people I loved back then! If you are not on Facebook, you should join. And then you should find me there! * My pets. They drive me batty, but they are sweet and loving. * A warm house and good food, and knowing that my husband's job is recession-proof. * Knowing that Matt adores his job. This is important, because I really believe that you should love what you do, and I am glad that Matt always loves his work and that he spends his days happy. * A beautiful place to live. I love my house, and I love this part of Long Island. We really have everything we could want on this tiny piece of land--gorgeous beaches, wildlife, farms, orchards, vineyards, a country type of life--but any sort of city amusements we want right at hand. * Good neighbors. We live in a part of the country where this cannot go unappreciated! Many many northeasterners live in places where their neighbors want nothing to do with them--and that was the case in our last house, which was across town! We now live in a neighborhood where we talk to our neighbors, help each other, and if I need a cup of sugar or someone to feed the chickens while we're away, I have people to ask! * Love of cooking. Both Matt and I love to cook and bake, and I have realized that not everyone does. I am happy that we do and that we have good meals and desserts because of it! * Creativity, imagination and intelligence. I am happy that my family uses their minds and their talents, enjoys learning new things, and takes pride in their abilities. * Good books. I just love good books! * Music. There is not enough music in the world for me, and I just couldn't live without it. * Photo albums. I was paging through the albums last night, looking at pictures of Matt and I when we first met, our wedding, our early days in Boston, Rachel and Julia as babies, toddlers and preschoolers....and then Ben joining the brood. Unfortunately after he was about 18 months we got a digital camera and now I have everything on disk and not in albums! (another resolution, I guess!) But it was wonderful to see my kids back when they were tiny, to relive those days and all the fun we had, and see how they have changed and yet not changed. I love photos! * Summer fruits. Boy, I miss them! But we still have two peach pies in the freezer. * Jon Stewart. He kept me in stitches all through the election process, and I think he is one of the most talented people on TV. * Politics this year. I am not going to go into a diatribe here, but I am unbelievably happy that things worked out the way they have and that we will move forward with the first African American president--it makes me proud to be an American for the first time in YEARS! * Hot showers. There just isn't much better than a shower when you need one, is there? * Online shopping. I really love the fact that I can shop for anything I need at any time of day or night and have it arrive on my doorstep a day or two later--and that so many places offer free shipping that you don't even have to pay extra! * Christmas trees. 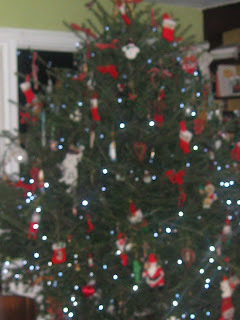 There is just something so wonderful about the tree every year. The piney smell, the familiar decorations with stories to tell, the ritual of choosing it and decorating it, the presents under it, the kids' excitement. I love it. * Having a fireplace. I am so glad Matt and I thought of the fact that we really didn't want to live in a home without a fireplace. We get so much enjoyment out of it. 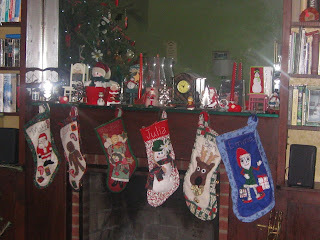 And really, without a fireplace, the stockings are just no fun! * The Beatles. I know I already did music, but I am a big Beatles fan and it makes me happy that their music is still so widely played and loved forty years after the fact. * Purses and shoes. I just love new purses and shoes. More so than any other items of clothing, they are just fun to buy! Even though my husband complains about it. * Movie quotes. Matt and I have known each other since we were 18 eyars old, so we have seen a lot of movies together, and there is just something nice and comforting about quoting movies to each other. * Netflix. Speaking of movies, I am so happy we joined Netflix! It's great to have a no-hassle way to see movies that we would otherwise miss. * Movie theaters. But even with Netflix, I love going to the theater and seing movies! * A daughter old enough to babysit. Rachel is now comfortable staying with the kids in the evening. Which means Matt and I can go out occasionally, something we never got to do when the kids were younger, and something we really love to do. * Fresh manicures. There is just something great about nails when they are pretty and polished--even if it never lasts long enough! * A gym membership. That is my Christmas present this year, and I am so excited! * Bagels. Real ones, warm from the oven. We had those over this past weekend when we were visiting my parents, and it is heaven. * Kids' responses to questions. I asked Emma what she was grateful for, and she immediately, without any hesitation, said: "You! And Daddy and Rachel and Julia and Ben and Grandma and Poppy. My whole family!" Really, I could go on and on. But I promised to play Monopoly Jr. with Ben and Emma. And my hands are hurting! And I'm sure you have lost interest anyway......peace and joy in 2009! We have had something of a snowstorm the past two days, and we are loving it! What could be better, five days before Christmas, than to have the yard covered in snow, mittens drying on the radiators, kids with pink, pink cheeks, and to take frosty walks to see the geese on the pond? For those of you unfamiliar with the East End of Long Island, we don't see very much snow, even less than New York City, usually. The effect of being surrounded by all this water (especially here, where the island forks into the two arms; we have the bay as well as the Atlantic and the Sound within 20 miles of each other...) means that while the western part of the island often gets plenty of snowfall, it usually doesn't get cold enough for us to have snow, or it blows off onto the ocean or some such disappointing nonsense. So any time there's snow in the forecast, we wait breathlessly to see what we'll get, and we're often disappointed. 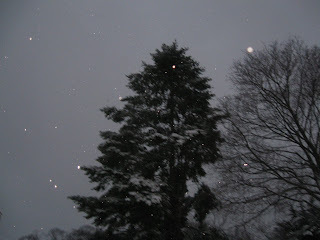 But yesterday, for our anniversary no less, it started snowing in the late morning and continued through the afternoon. We had perhaps four or five inches, and Matt and I talked of walking downtown to our anniversary dinner of Greek food-- we thought it would be fun to walk a mile together in the snow, holding hands and talking, like when we were in college again--but then, unfortunately, it changed to rain and we had no desire to walk in that, so we just took the car instead. I put on a brave face to the kids, but inside I was upset about the rain--I pictured all the beautiful snow melting away in the night and waking up to the bare trees and brown and gray landscape that is the worst part of winter to almost everyone. Luckily, when we woke this morning, and indeed, all day long, tiny flakes were flying through the air, a great many of them most of the time. 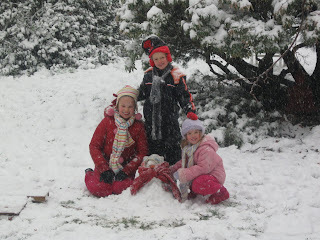 I don't think we have six inches, but still, the kids were thrilled to play in it, and it has been lovely doing our Christmassy things like wrapping gifts and baking, baking, baking with the snow flying. When we shoveled we saw the evidence of last night's rain--about an inch of the snow had turned to ice--but what was on top was lovely and powdery, and under the ice layer is too. And the good thing is that the ice layer will probably make the snow stick around longer, so that makes me happy! Matt has been breaking his back in the kitchen today, making cookies and more cookies to bring to the office and to pack up to mail to family...and yes, we know they won't get them before Christmas, and we are very bad for procrastinating. Sorry about that. As I've posted already, we have had a hard time this year getting into the whole holiday rush, and we had several gifts to find and now we have another thing to do so the packages won't go out till Monday. These relatives will just have a nice treat after Christmas, and out gifts won't get lost in the shuffle. Put a positive spin on things. 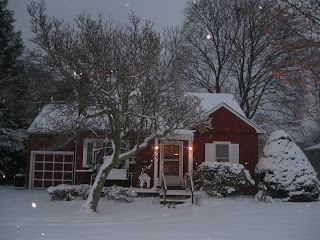 Anyway, here's hoping that the loveliness will last as long as possible, because I really do love snow! The kids built a tiny snowman--this was taken early in the afternoon when there wasn't really enough snow...Now he is mostly buried in the yard; you can see the hat and scarf sticking out at the top. I realized last night that I haven't blogged in a while. I'm sure everyone understands that at this time of year! It seems that every day is speeding by, even though we have been staying home a fair amount. I foolishly left all my holiday shopping till after we got home from Boston this year, and with Rachel's birthday on the 8th I didn't have time to really even begin till after that! I began my shopping online, which made me feel better because I was able to spend a few hours and get a good chunk of shopping completed. Then we had Rachel's birthday party, which was a sleepover, so there was shopping, cleaning, baking and cooking to do for that, and in the aftermath there was rest! I began shopping again this week, this time in person because I didn't trust ordering things anymore and didn't want to pay extra shipping fees. Matt and I went out together on Sunday evening, leaving Rachel in charge at "night" for the very first time (it was from 5-7:30 pm, so it was dark but not late!) That went very well; the kids had a good time and Rachel didn't worry about us dying en route to Target. Matt and I were able to shop in peace and we had fun being together. I spent some time wrapping gifts, too, so finally we have boxes under the tree. I went out alone last night to three stores, and got another group of gifts taken care of. One of those stores was Linens N Things, and I have to say that was a creepy experience! The chain is going out of business, so I went in hoping to scoop some good bargains....but unfortunately, everyone else has been there before now, because the store had maybe 4% of its inventory left--it was a barren wasteland and they are even trying to sell the shelving units they used to have their stock on! What they had left was mostly useless, damaged or too ugly to be believed, so I left empty-handed. On Tuesday night Matt and I had the sublime treat of going out to dinner with our friends Dan and Trisha. Just the adults! Their daughter Chloe helped Rachel wrangle the younger kids for the evening, and we went to Tweed's, which is just a mile away on East Main Street, so we would have been home in 5 minutes had anything gone wrong. That went very well, too--I am proud of Rachel for overcoming her fears of babysitting at night. It's nice to know that we can go somewhere close by for a while and she's all right with the responsibility. We had a fantastic dinner, great conversation, and lingered over after dinner coffees. While I enjoy eating out with my children, it is very nice to be with adults and talk uninterrupted about anything that comes to mind without concern! Trisha and I spoke the next day and we want to make this a monthly event....sounds great to me! Tomorrow will be a wonderful day. We are going to Trisha's to make gingerbread houses with friends, and then Matt and I will go out to one of our favorite restaurants for dinner to celebrate our anniversary. Sixteen years tomorrow--I can't believe it! Seems like a week ago we went to the city to spend a weekend for our fifteenth, and here we are with another year gone by. Rachel's babysitting skills are getting a workout this week! We will enjoy Greek food at Athens on East Main Street, which will be especially nice because we won't have to explain the menu to the kids, figure out what they will possibly eat, or listen to any remarks about the poor lambs that died to make this meal....we are planning to talk about only romantic, loving things and generally act like sixteen year olds in love instead of kind of middle aged parents for a change. Over the weekend I plan to hopefully finish the shopping, do the rest of the wrapping, and bake up a storm. We usually make gift boxes for neighbors and many folks at Matt's office, but because the season has escaped me this year we are going to bake several dozen cookies and maybe some sugared nuts, candy and quick breads or cakes and send that in to the office with Matt so that people can have some treats and know we care....I feel sort of guilty but I'm letting it go! The neighbors I still want to make sure I give to because they are nice people, and several are elderly with not much family so I think it means a lot to have a treat sent over. Then next week we will go to Mom and Dad's on Christmas Eve and spend the long weekend with them, ending in the big family Christmas at Susan's on Sunday. I am looking forward to that--when all the work is done and it's just time to enjoy ourselves....and the week after that we will have fun, plain and simple. Still vacation time, no more pressure. Matt may take some of that week off and we are looking to do some fun things--I am hoping to go ice skating in Greenport too. love this one of Julia and Emma! Ben and his brand new hat! Catching Up--A Very Busy Few Days! Today we rode the T down to South Station and walked over the bridge to the Children's Museum. I was very happily surprised to see that the entire place had been renovated, and it was completely different from the last time we were there. Well, not completely different, because there were many exhibits that were the same at the heart of them (Arthur's World, the Bubbles Room and the Raceway, the Construction Zone) and yet were changed just enough to make them more interesting to us, who have been there over and over again. The strangest part was that, although it was obviously in the same building that it's always been in, they changed the layout around so much that it was nearly unrecognizable. They moved exhibits from the floors they'd always been on, they changed where the front desk, coat room, lunch room, and gift shop were, they added floors where there used to be openings for climbing, and even the hallways seemed to be laid out differently. Strange but it definitely made the day more fun. Highlights included a game of basketball between me and Ben, the new climbing structure they have with curved platforms instead of flat, the room designed to show kids exercise can be fun--complete with rock climbing, a light-up dance floor, seats that you could raise in the air by pulling your weight on a rope, bouncy seats that raised a ball up a tube, and incumbent bikes that lit various lights to show how long you could ride. The bubbles and water play are always great, and the exhibit about kids in China was very good too. We were disappointed that the Japanese House was closed today, and that we couldn't play in the Art Studio because we didn't travel by car and I didn't want to lug projects around with us! Arthur's World was fun too, since they added to it, though we laughed at the kitchen doorway that was marked to show the kids' heights at different ages--they had Arthur at 8 years old marked shorter than Emma is, and D.W. at 4 years old marked about the size of your average 10 month old! And in case you say anything about them being aardvarks--Mom was marked taller than I am, and Dad taller than that! We walked over to Quincy Market after the museum and met Matt and our friend Sharon for dinner. We also got Emma the pair of fuzzy Crocs I mentioned not buying the other day--because this week while we were here she has had TWO pairs of shoes break! Including her old beloved Crocs that she's been wearing for two years...we got her pale pink ones with sheepskin inside for winter. I love them but the only problem is that of course with the lining they are no longer waterproof...also we had to get them huge because of the lining, so they look just a bit weird. But she seems to like them and at this point I can't ask for any more than that with Emma and her shoes. Took our last T ride and our last swim in the pool....the kids are of course bummed that the trip is over. I am too, in a way, but it's always nice to go home too. Besides, we can now quit hemmorhaging through the wallet when we leave here--oh, wait, it's Christmas time, so we really can't! Which reminds me that I have done NOTHING for Christmas....hold on, I'd rather stay here indefinitely! Dreams are the illusions in the book your soul is writing about you. We went back to Santa, who had a very detailed conversation with Ben about what he wanted for the holidays and where he lived...he was amused when Ben told him that what he wants most for Christmas is an alarm clock--which I have to say is pretty much going to be a big disappointment for him, as the last thing I need is for him to get up any earlier! He talked to Emma and Julia as well, but not to Rachel since she was pretending not to know us so she wouldn't have to speak with Santa--till I ratted her out and he beckoned her over! That was good for a laugh, I can tell you. The photographer from the Globe took some photos of the kids with Santa, so who knows whether or not they might be in the paper. We meandered through the shops in the North and South markets, as well as the kiosks inside. We came upon a hat seller and watched the embroidery machine do its work, when it hit me--the perfect way to get Ben to give up his ratty old hat for a nice new one. It took a bit of convincing, but then he was swayed by the fact that he could choose the color and watch them machine embroider his name on the front. He chose dark green with white writing, and it looks very fine. I promised him no harm would come to the old hat in my purse, and he handed it over and put on the new one. We ate lunch inside and then listened to a fireman's band wail on the bagpipes for a while--I'm not really sure what they were doing. There were fire trucks parked in front with a huge American flag strung up between them, and they played "Amazing Grace," but it didn't seem very solemn or sad. Then we walked on and watched a South American combo play for a while--they were very good but then it began to get too cold to stand still. We talked and decided that we were done at Quincy Market and wanted to walk back to the hotel through the Common and the Public Garden. We began to walk and soon came up Beacon Street by the State House, where we crossed into the Common. We had a brief struggle when we passed the Frog Pond and saw the ice skating--the kids of course were clamoring to skate but I said no because I knew that I didn't want to ice skate for two or three hours and then try to walk back to the hotel! Also, it was a more crowded rink than we are used to, and a broken arm or even a bump on the head isn't fun when on vacation....however, once we passed the skaters everyone got over it. We bought some honey roasted peanuts and cashews and soon noticed the squirrels. Now remember, Matt and I spent five years living in Boston, and we have been coming here this same week of the year since Matt started working at APS, so that's been eight years. I know all about the super-tame squirrels. And we have fed the squirrels before too. But this was the first year that Julia was almost 9 years old seeing these squirrels...Julia the animal handler. In a trice, she had these squirrels sending their little squirrelly signals all over the park, and she had them eating out of her hands. Literally. (This was helped by the fact that we were feeding them the honey roasted nuts as opposed to whatever toddler snack I was digging out of the bottom of the diaper bag in former years, I'm sure!) These squirrels were precious--they certainly knew their audience. They came to kissy noises, sat on their haunches and when we held out our hands they came right up, put their paws on our hands and took the nut, lickety split. Julia even had them climbing onto her knees to get the nuts! We made our way through Boston Common and through the Public Garden, squirrels on our heels, till we ran out of nuts. At the end we even had pigeons and sparrows following us, and they loved all the candy bits at the bottom of the bag! We played on the duckling statues and climbed trees and watched the ducks (lamenting the fact that we had nothing to feed them...) Finally we made it to the other side of the Garden--right by the statue of Paul Revere by Arlington Street. I pointed him out and said something about his horse and how he warned the people that the British were coming, when Emma piped up, "I don't see a horse, and he looks like a BABY!" I realized she was looking at a Cupid in a fountain, not at the correct statue at all! The rest of the walk was uneventful, just up Newbery Street to Dartmouth and over to Copley Square to the hotel. We spent the remainder of the afternoon in the room relaxing--I checked email, read a while and even napped just a bit while the kids played and then watched some PBS shows. We went to Charley's with a group of friends, which is one of the restaurants Matt and I loved when we lived here and always make a point to go to when we're here. We had a delicious dinner and fun talking with our friends, and then made our way back to the Westin, where Matt took pool duty. Only one more full day and we are all so sad! I love Boston! I have found the paradox: if you love until it hurts, there can be no more hurt, only more love. Today the kids and I decided to stay near the hotel. We slept late, first of all, and by the time we were dressed and had eaten breakfast, it was 11:30. Matt had an evening reception tonight so we had to have an early dinner, and it didn't make sense to try to go to a museum when we had to be back at the hotel by 4:30. So we went to Barnes and Noble, a favorite hangout of ours. We spend hours there, looking at books, reading aloud and playing games with assorted stuffed animals. I also snicker to myself, listening to Boston mothers complain about their nannies and assorted servants...and sometimes about problems collecting Social Security payments. (That was snide, I know--but having lived in Boston I feel confident in saying that the average mom in this city is pretty close to ancient!) Today we had another reason to linger in the bookstore, and that was that my old friend from elementary school, Dara, was coming in from Chestnut Hill to meet us, and I wanted to meet her somewhere the kids would be reasonably busy so that we could chat and catch up. When Dara walked into the children's section, it was so weird! It was like seeing a taller version of the girl I knew...same eyes, same face, same laugh. We started talking a mile a minute--and then her phone rang, and it was her daughter's school nurse...Dara had told me that her kids had been sick over the weekend but were now back in school, so it was just very unfortunate that she wasn't quite well enough to stay at school--Dara had to basically fly back home almost before we'd started to talk. We promised to make better plans for next year, we took a few photos and then she had to be off. After she'd gone the kids and I figured out what we were going to buy. Rachel got two of the "Maximum Ride" novels, Ben got two "Star Wars" activity books, I got a school book for Ben--and had to get the 2nd grade level because 1st grade was way below him--and Julia and Emma got small stuffed animals. Sigh. Not that we need any more stuffed animals in our house! But they were spending their own money and they are playing great games together with them, so I gave in. We paid for our stuff and headed back to the room. The kids played and then watched a bit of TV while I read my book, took a short nap, and knitted a while. Then Matt came home and off we went for dinner. Today everyone but Matt slept till 9:00! (Hooray for hotel drapes, which make any hour of the day seem like midnight when closed! Matt had to get up early for his meeting; otherwise I am sure he would have been right there with us.) We got dressed and headed down to Starbucks, our traditional place for breakfast (and grand coffee!) where we had egg sandwiches and coffee cake. Then we headed out to the Green Line T to get to the Museum of Science. I'd misremembered that we could go there on just one train; I thought I'd remembered it being on the red line, but when the concierge told me it was on the green line, we decided to do it. The kids are enjoying the trains and I like saving the money on parking. A small aside about the museums. While I love going to museums, I have a hard time with repetition, and although we are only in Boston once a year, the museums here had gotten somewhat tedious for me. It seemed that everything stayed the same year after year, and I had started to feel a well-worn path developing. We didn't go with Matt on this trip last year; so I was hoping that the breach would improve my feelings at going. I am very happy to report that at least at the Museum of Science, a lot has changed, so I didn't feel bored at all. The Omni theater show about dinosaurs was a huge hit! We have never gone into one of those shows because I was afraid to spend a ton of money and then have a small child terrified of the intensity. Because I got a membership to the museum, we had two free passes, which meant we only had to buy 3 children's tickets, so we went for it, and I did not regret it. The show was breathtaking and informative--it was a combination of information about paleontology and archaeology, with scenes of dinosaur life thrown in--and with scenes of the Gobi desert and the American Southwest, it was visually stunning. We all were sad to see it end. We saw a chick actually hatch from an egg! This was the first time we'd seen the process completely (ironic since we have chickens of our own!) Our library hatches chicks every spring, but we don't ever get to see more than maybe a beak chipping at the eggshell. This was full-on, egg cracking, chick sliding out, panting on its back, having to garner its strength to stand up action! We also watched the white topped tamarins for a while--they are so cute it started the kids talking about monkeys as pets---um, yeah, they can forget THAT! Julia's favorite was the butterfly garden, a greenhouse full of live butterflies. We saw many different varieties, and they landed on us at will, especially Julia who was dressed in pink from head to toe and looked like a flower! Emma was not as happy in there because they had to keep it hot for the butterflies (85 degrees, according to the guide) and she was wearing a velvet outfit! So after a while she sat on a bench near a small jet of cool air and watched as Julia and Ben exclaimed over each and every butterfly. We got to watch them eat fruit, sip from flowers and even from puddles of water on the floor. They ranged from the size of a quarter to the size of a large man's hand, and one owl butterfly (so named because of the spots on its wings that mimic an owl's eyes to keep it safe from predation) took a half hour ride on my purse! I don't know what he found so interesting--it is a brown leather purse, so not colorful like a flower, and with nothing to eat unless he could smell the gum residing inside! We spent a great deal of time in an exhibit about the senses. Emma really liked a game where you squeezed plastic squirt bottles (like the ones ketchup is in at a diner) and put pictures of the scent near the bottle. She was very good at it, too--although I think the one they thought was grass scented smelled much more like flowers. I played the advanced level game, which combined three scents in one, and did pretty well, though the third scent sometimes eluded me. In general, there was always a very overpowering scent (like chocolate or coconut) which made it hard to identify the other two. Emma and Ben also enjoyed a game where they sat on opposite sides of a curtain and one would build a block tower and direct the other to build the same one, and then they'd check to see how close they were. I am proud to say that their rapport and listening skills made them get it correct every time! And, of course, no visit to the Museum of Science would be complete without a trip to the children's playroom--though I am a bit sad to report that my kids are growing a bit too old for this place that we used to spend no less than an hour in each visit. They enjoyed watching a black chipmunk in the tunnel tank, and Julia, Ben and Emma played a pretend game of bees for a while (there is a giant plastic hive complete with cubbies to sit in and bee jackets to dress in, as well as pollen to collect and little bee puppets to play with) but since Rachel was bored there she convinced the kids that they really wanted to go see the chicks and monkeys! So when we were tired and the museum was closing anyway, we headed to the gift shop, where we bought some postcards, small souvenirs for Rachel and Julia's good friends, a rocket model for Ben and silver frog necklaces with crystals on them for me and the girls--Rachel and Julia got green ones and Emma and I chose pink. They will be a sweet reminder of a lovely visit to the museum. We rode the T back to Copley in the middle of rush hour, met Matt and went to Legal Seafoods with some friends from the office, so all in all it was a wonderful day. More tomorrow! It seemed the world was divided into good and bad people. The good ones slept better...while the bad ones seemed to enjoy their waking hours much more.